Cable Tensile Tester | Tensor Machinery Ltd. The cable tensile tester is designed to test cables by pulling them up to 2000lbs force per leg at a controlled and programmable rate. The test apparatus is designed to meet the EIA Specification for FOTP33B and consists of a stationary stand with 3 turning sheaves at one end and a stand with a movable carriage at the other end. 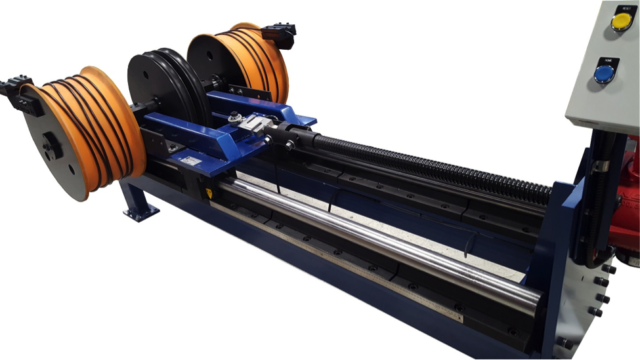 The cable is secured around interchangeable sheaves and a motorized actuator pulls the cable at the desired pull rate up to the programmable tension. 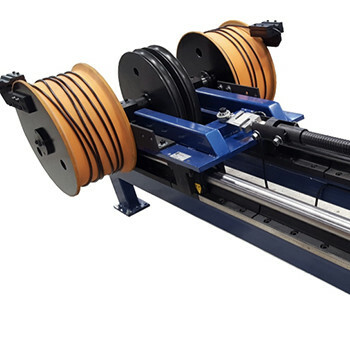 The tensile tester unit is automated to make it easy to test any cable to ensure your cable meet their required design.